NETWORK FINALS: NBC’s AMERICAN NINJA WARRIORS rerun gained 0.1 in final numbers, while FOX’s NASCAR race and the rerun of THE BACHELORETTE lost 0.1. CABLE HIGHLIGHTS: Yes, it was a holiday weekend, and sure, the second 2-hour chunk of Showtime’s TWIN PEAKS had been available since last week via VOD and streaming. (And to be fair, perhaps in the economic model of pay-TV, the media buzz alone was worth the network’s investment as a cost of branding.) Still: a 0.11 plunge to 0.04 is awful, and the collateral damage may be next Sunday’s premiere of the stand-up comedy dramedy I’M DYING UP HERE, which is likely to have a tiny lead-in to its first linear airing. On HBO, THE LEFTOVERS ticked up to 0.30, SILICON VALLEY fell 0.09 to 0.32, and VEEP was down 0.04 to 0.19. On Starz, THE WHITE PRINCESS lost 0.05 to 0.17, and AMERICAN GODS added a tick for 0.26. Scripted shows were led by Adult Swim’s MIKE TYSON MYSTERIES, although it had a sizable 0.16 drop to 0.40. Hallmark’s THE GOOD WITCH shed a tick to 0.18. Lifetime’s original movie SINISTER MINISTER was at 0.29. Sunday cable was topped by Discovery’s NAKED & AFRAID, although it took a hit at 0.55, down from last week’s 0.72/0.64 for 2 episodes. Univision’s LIGA soccer match was at 0.49. On E!, KEEPING UP WITH THE KARDASHIANS shrank by 0.21 to 0.42, and WHAT HAPPENS AT THE ABBEY was down 0.03 to 0.15. 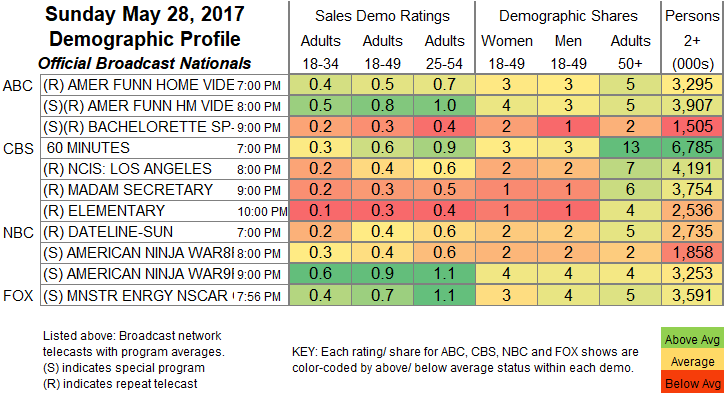 On Bravo, REAL HOUSEWIVES OF THE POTOMAC slipped 0.04 to 0.39, and INVITE ONLY CABO was up 0.03 to 0.21. On Food Network, FN STAR dropped 0.05 to 0.35, and GUY’S GROCERY GAMES was at 0.28. 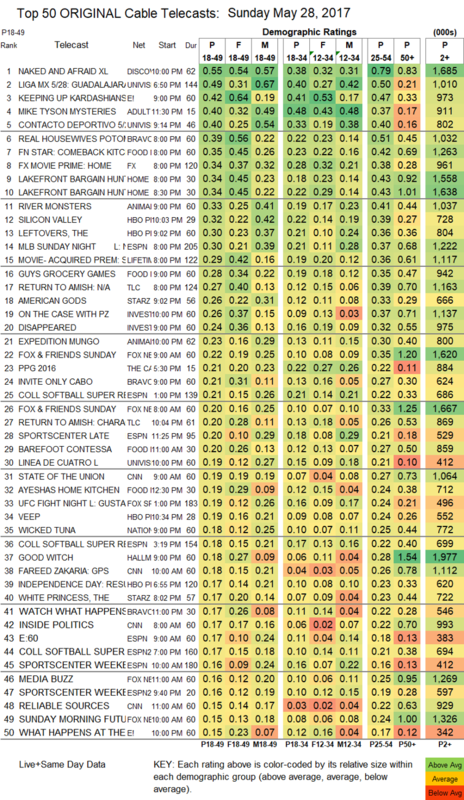 HGTV had a pair of LAKEFRONT BARGAIN HUNTERS episodes in the Top 10, both at 0.34. Animal Planet made an unusual appearance in the Top 11 with RIVER MONSTERS at a steady 0.33, and lead-out EXPEDITION MUNGO was at 0.22. On TLC, RETURN TO AMISH ticked down to 0.27, and the AFTER-SHOW was up 0.01 to 0.19. On ID, ON THE CASE WITH PAULA ZAHN was at 0.26, and DISAPPEARED was at 0.24.